ComputerG offers a wide range of graphics cards for Desktop PCs, Gaming PCs and Workstations from nVidia & AMD. Find the best offers on brand new graphics cards with manufactuer warranty..
XFX Radeon HD 5450 Passive 1 GB DDR3 DDR3,HDMI,DVI,VGA,1SThe XFX ATI Radeon HD 5450 graphics card of.. 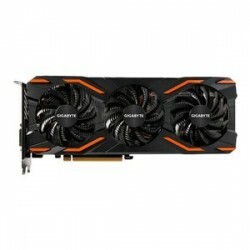 Product Description Sapphire RADEON HD 5450 Graphics Card 2 GB GDDR3Device TypeGraphics cardMem..
EVGA GF GT 210 1GB DDR3 Graphics Card 01G-P3-1313-KR Manufacturer product number: 01G-P3-1313..
Gainward GeForce GT 710 SilentFX Graphics card | GF GT 710 | 2GB DDR3 | 954 MHz | PCIE 2.0 | DVI, D-..
Gigabyte GeForce 210 1GB DDR3 Graphics Card - GV-N210D3-1GI 6.0Device Type: Graphics card - low prof..
Palit GeForce GT 710 Passive 2GB DDR3 Graphics Card - NEAT7100HD46HDevice Type: Graphics cardBus Typ..
ASUS 710-1-SL Graphics card| NVIDIA GeForce GT 710 | 1GB | DDR3 | 954 MHz | 64-bit | 90YV0941-M0NA00..
MSI Nvidia GeForce GT 710 Graphics Card 2GB GDDR3 HDMI, VGA, DVI-D V809-2000RDevice Type: Graphics c..
Gigabyte GF GT 2GB graphics card GV-N710D5 2GL Device Type: Graphics card - low profileBus Ty..
ASUS Nvidia GeForce GT710-SL-2GD5 Graphics Card 2GB GDDR5 HDMI, VGA & DVI-D 90YV0AL1-M0NA00Devic..
Palit GeForce GT 730 Graphics card | 2 GB DDR3 | 902 MHz | 64-bit | PCI Express 2.0 x8 | DVI-D, HDMI..
MSI N730 2GD3 GeForce GT730 2GB DDR3 Graphics card - V809-001RDevice Type: Graphics cardBus Type: PC..
MSI GT1030 AERO ITX 2GD4 OC Graphics Card - GF GT1030 - 2GB - V809-2824R Graphics Engine: NVIDIA Ge..
MSI Nvidia GeForce GT 1030 - 2GB - DDR4 Graphics Card - V809-2825RDevice Type: Graphics card - low p..
Palit GeForce GTX 10 Series GT 1030 Graphics card - NEC103000646-1082FDevice Type: Graphics cardBus ..